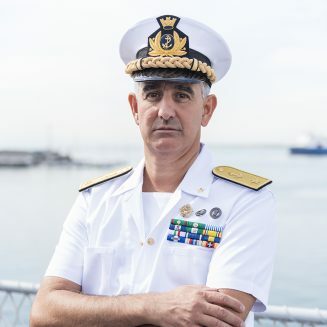 Rear Admiral (LH) Stefano Turchetto is the Force Commander of the Eunavformed operation “Sophia” Task Force from September 13, 2018. Recently, he has been Head of the Italian Joint Operations Headquarters Commander’s Office from October 3, 2016 to July 1, 2018. 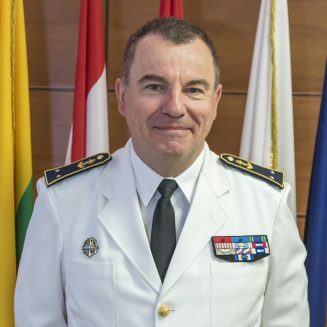 He graduated from the Naval Academy in 1989 achieving with honors, a degree in Naval and Maritime Sciences from the University of Pisa, Italy, and he attended the 6th Joint High Level Staff Course at the Defense High Studies Center in Rome being assigned to the Center in 2004 as a tutor for the following courses until 2006. 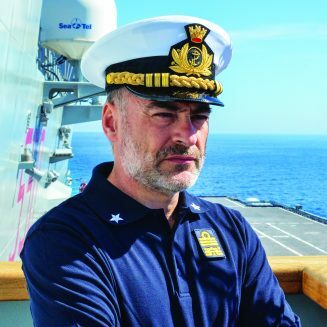 He has been onboard Corvette Driade, Frigates Alpino and Libeccio, and Cruiser Vittorio Veneto serving as Anti-Submarine Warfare Officer, Chief of the Sonar Branch and Operations Officer. He commanded ITS Libra, ITS Libeccio, the first course including female personnel in the Naval Academy and ITS Andrea Doria, employed in the main national exercises and in support of the Italian UNIFIL Contingent. He was also the Second in Command in the Naval Academy. He also served in a number of prestigious shore appointments. He was Liaison Officer at the German Ministry of Defense in BERLIN. He served to the Chief of the Italian Fleet in Rome as Head of the Training and Regulations Division. Rear Admiral TURCHETTO is married and has two children.